Electrolytes are minerals in the body and compounds that bind to them to create salts, such as sodium, potassium, magnesium, chloride, calcium, bicarbonate, phosphate, and sulfate. Electrolyte molecules are positively or negatively charged, which allows them to carry electrical impulses that transmit nerve signals and contract muscles. They also maintain fluid and acid-base balance, making them indispensable for a healthy human. A normal diet provides more than enough electrolytes to meet the body’s needs for most people. But there are times when electrolytes from food alone may not be enough. Athletic endeavors: For light exercise in moderate climates, replenishing water without electrolytes is sufficient for most people. But when temperatures rise or workouts are prolonged, more electrolytes may be lost through sweat than can be replenished with food alone. Hot climates: In very hot climates, sweating is the body’s way of ridding itself of heat, but unfortunately this rids us of electrolytes too. People who spend a lot of time outdoors, such as construction or landscaping workers and athletes training in hot climates are most likely to need electrolyte replacement. Tip: Muscle cramps are one hint that electrolytes may be running low when you’re sweating a lot. Stomach and intestinal upset: When we lose fluid through vomiting or diarrhea, we also lose plenty of electrolytes. This can lead to dehydration and in severe cases, life-threatening electrolyte imbalances. Tip: Young children are particularly susceptible to excessive fluid and electrolyte loss when sick, but adults can experience this too. Sports drinks: For healthy adults, sports drinks are most popular for electrolyte replacement, but if you’re working out with weight loss in mind, watch the sugar content. Many people don’t need the extra calories. Electrolyte-enhanced gels and bars: These may be a good choice for those who need to supplement calorie intake, such as endurance athletes who are training multiple hours per day. Electrolyte tablets (and plenty of water): If your workouts quash your appetite, these can help get you through, but take in some calories as soon as you can. Child-specific products: When little ones are sick, reach for products made especially for kids. (They often have the word “pedia” in the name.) 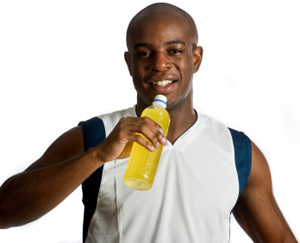 Sports drinks may contain sugar or artificial flavors and colorings that can upset an already sensitive tummy.